The Zip Track is specifically designed to overcome the hurdles of indoor zip line design and construction. The rigid steel track does not sag like a traditional zip line cable. This allows a zip line to be installed in a facility with lower ceilings, and it keeps the zip line rider as high from the ground as possible. In facilities with high ceilings it may be possible to zip line over existing floor attractions, making profitable use of what would otherwise be considered dead space. A rigid track is one of the key features to indoor zip line success. Suspended installation from existing structural elements is the second key element of our Zip Track system. Unlike traditional zip lines, our Zip Track produces predictable structural loads. This allows us to engineer attachments to your building without adding expensive structural load towers. In most cases we can simply use steel cable to hang the Zip Track from your existing z-purlins. This simple and effective installation method keeps costs low, and may be the make-or-break of zip line feasibility for your facility. The Zip Track is very flexible, and it is one of the few zip line options that can make good use of your existing mezzanine, overlook, or balcony. We don’t insist that you buy an expensive launch tower or platform from us. It just makes sense for you to use of what you’ve got or have your local general contractor build you a platform. Of course we will still provide input to make sure everything is compatible. We offer a myriad of zip line braking options depending on your needs. Shorter zip lines can take advantage of our exclusive Auto-Retract device. The Auto-Retract serves double-duty as the brake device and trolley retraction method, all without any power requirements! It has a 5 year track record of success on our award winning Mobile Zip Line. Longer zip lines will have more traditional braking mechanisms, and we can even incorporate secondary, passive, backup brakes if required by local code. Our professional team will find the safest and most efficient solution for your needs. Zip Lines are some of the hottest attractions in the amusement industry. 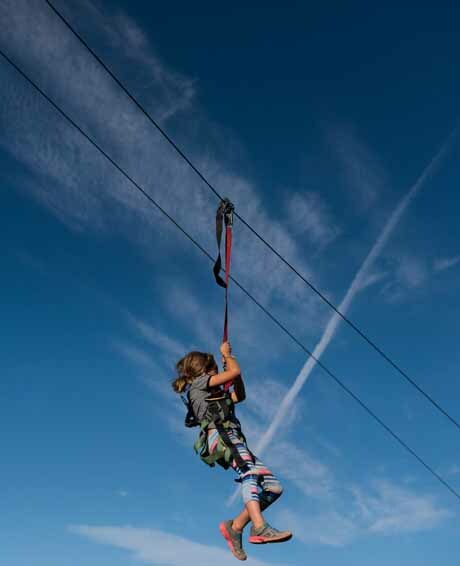 The experience demands a premium ticket price, and when multiplied by the high-throughput capabilities of a zip line produces exciting revenue potential. This is an attraction that will boost your attendance numbers and bottom line!